JTC about to embark on the Amazing Race: Lima Edition. I’ve always been a fan of The Amazing Race, but I never thought I’d actually be in one. Today, I had the chance to take part in Junior Team Canada’s Amazing Race: Lima Edition. 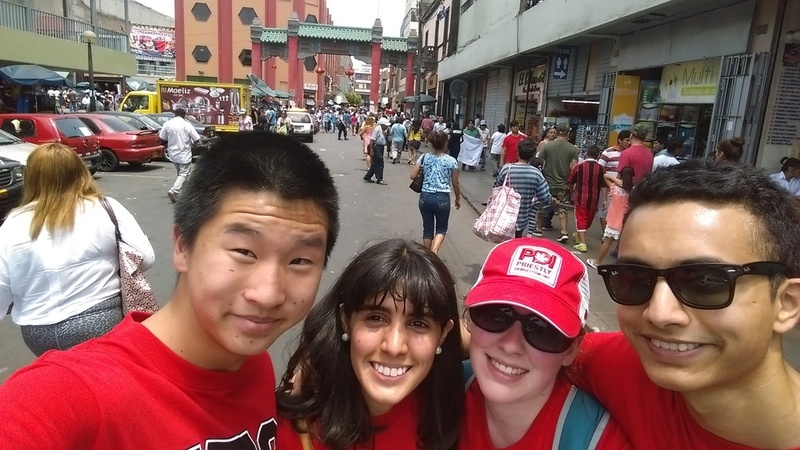 My team, led by Rubi and Estefania (USIL students), explored the city of Lima while looking for various checkpoints. From taking pictures at Kennedy Park to running through a cluster of pigeons in “San Francisco”, I had the opportunity to discover four incredible districts of Lima: Miraflores, Barranco, San Isidro, and Centro de Lima. In Miraflores, we watched surfers masterfully tame the enormous waves of the Pacific Ocean. In Barranco, we explored some of Lima’s oldest buildings. In San Isidro, we watched a dog show in the colonial olive garden. And in Centro De Lima, we watched “El Cambio de Guardia”—the changing of the guards in front of the Presidential Palace. While I started off a little groggy due to limited sleep, I ended the race invigorated and in awe of Lima’s diverse architecture and culture. While we ended up being the last team to arrive at the finish line, we were the only team to hit all of our checkpoints. Today was fascinating, but I can’t wait to explore more of this beautiful city with my fellow JTC ambassadors!